I was shocked to read about the sudden closure of a well-known luxury safari operation in the Selous reserve in Tanzania, as reported in Africa Geographic this week (read the AG article here). My dismay was not only because I personally know the owners of this wonderful operation and know what a terrible blow this must be to them. It was also not only because of the tragic loss of tourism jobs and potential for safari goers to share in the incredible wilderness of this part of the Selous in Tanzania. My deepest alarm came from the realisation that the Selous will lose 150,000 Hectares of wilderness landscape to alternative land use, and this at the cost of some 2.6 million trees, and an uncountable number of other plants and animals. To clarify my position, I do not believe that Tanzania should be deprived of the option to solve their electrical supply problems, and I do realise that there are probably many facets to this issue that I am not even aware of. However, this event has once again highlighted the reality of our greatest threat to the survival of wildlife in Africa - The availability of land. For some years now, I have been arguing for the real imperative that we should all be focused on: To unify the conservation community behind a common goal of preserving wildlife habitats from alternative land uses, and not allowing the fragmentation of interconnected wilderness spaces, as this too reduces the populations of animals that these habitats can support. So, with this imminent loss of land in the Selous fresh in my mind, I came to wondering about how to illustrate again the importance of this imperative. The relationship between the well-being of wild animal populations and habitat sizes can be found in the many scientific papers that analyse the dramatic decline in various species’ numbers over the last hundred years or so. In this article, I am choosing to focus on the two most iconic examples of such declines - lion and elephant populations. Please note that this piece is not intended as a scientific paper, it is not peer reviewed and it does not claim to answer all problems facing African wildlife. Instead, it is aimed at highlighting the almost linear relationship between animal populations and availability of habitats that those animals have to survive in. Let’s begin by looking at lions. 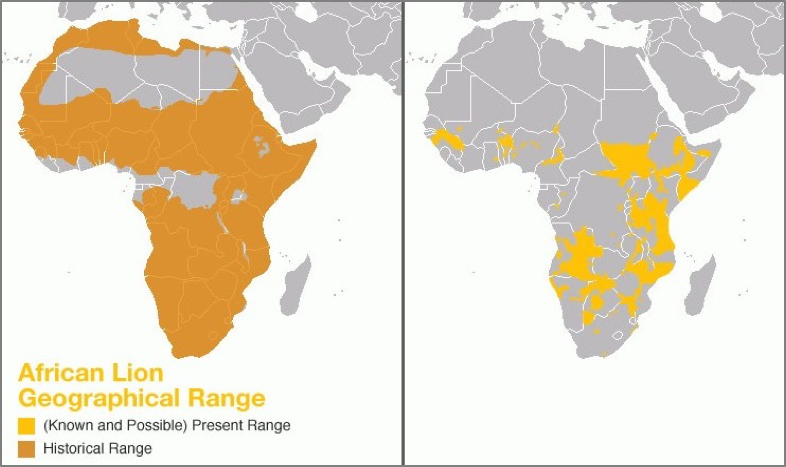 In the case of lion, the maps below show the decline in lion range area from the historical full range extent of lions in Africa, to the current picture, which represent about 8% of historical range according to the data published on the IUCN Redlist of Threatened Species (latest assessment dated 20 June 2014). It is well accepted and widely published that the lion population in Africa has decreased in the last century by 90%. 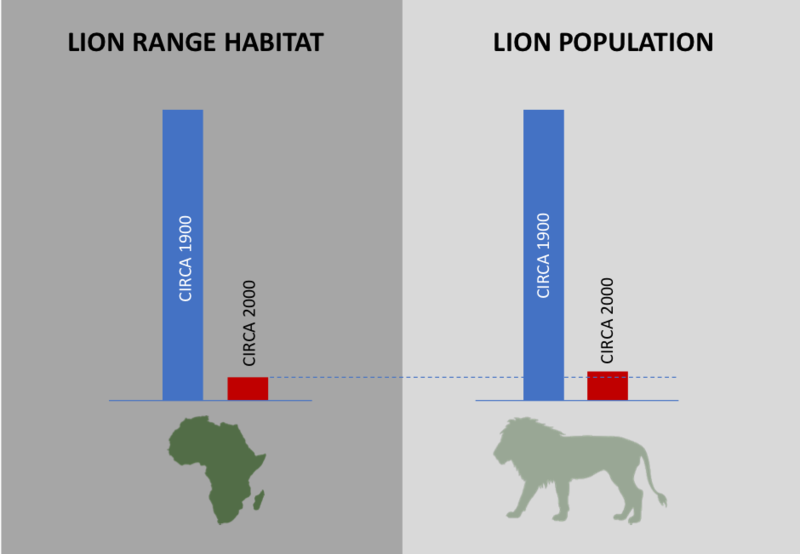 So, comparing these numbers then shows the population reduction mirrors the reduction in range habitat of 92%. 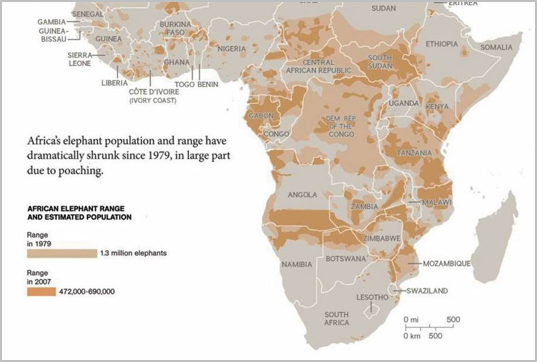 Turning to elephant, there was a well-reported drop in elephant numbers from 1979, when the estimated African elephant population stood at 1,3 million, to 2007 where the population had dropped to between 472,000 and 690,000. At best, the population reduction was 47%, while at worst it was as much as 64%. Let’s assume it to be the worst at 64% drop in the elephant population. Since then, there was a further 30% drop in elephant numbers as reported in the Great Elephant Census of 2014. 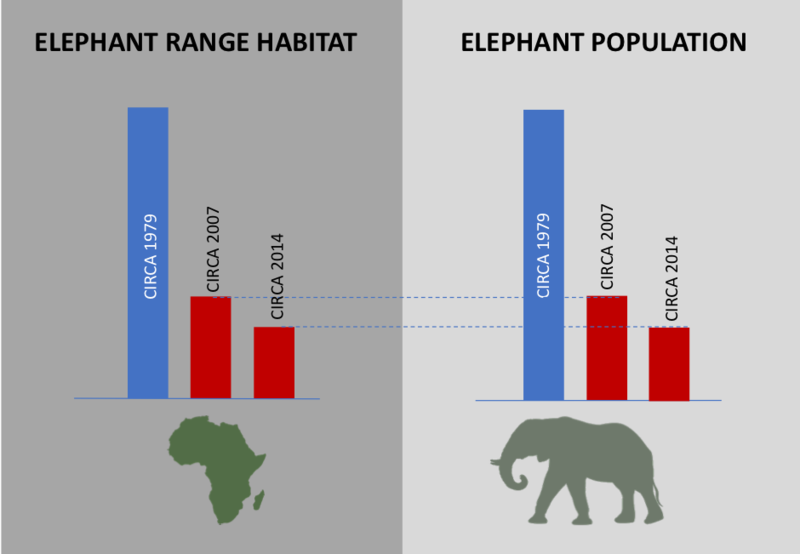 Let’s then look at the range maps of habitats which supported elephant in 1979, to that of 2007, and then again in 2014. 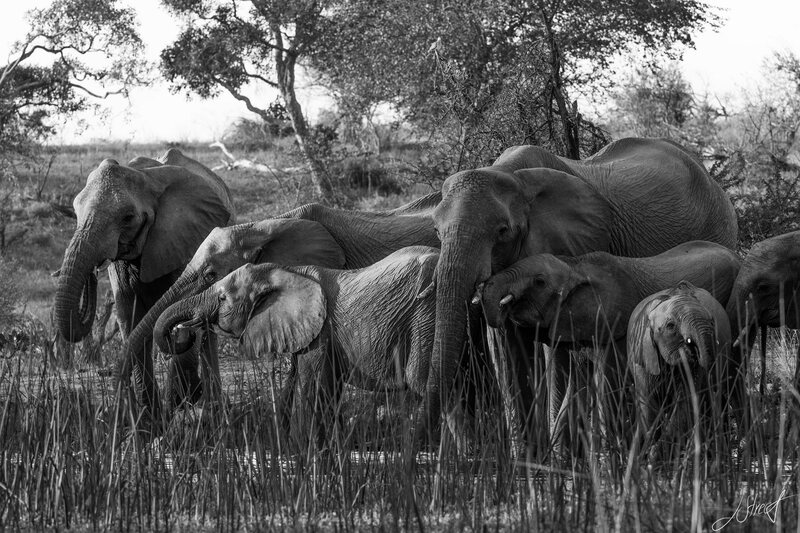 The available range habitats for elephants had reduced by at least 65%, between 1979 and 2007, further dropping by another 30% between 2007 and 2014. There is an astounding correlation between the population drop and the available range habitat data. Closer to home, here in the Greater Kruger, we experience the same land-use pressures that conservationists face all over Africa. A pressing example is the proposed 120 Hectare citrus farm development on the border of the Greater Kruger National Park, also reported on by Africa Geographic (read the full AG article here). Today we are awaiting a decision from the authorities on whether this development will be allowed to go ahead. If it does, it will represent another loss to the collective wilderness landscape, and will drive a wedge of agricultural development in between existing protected areas. If these types of development are allowed to continue, it can lead to the fragmentation of a network of protected areas that has taken many decades to integrate. 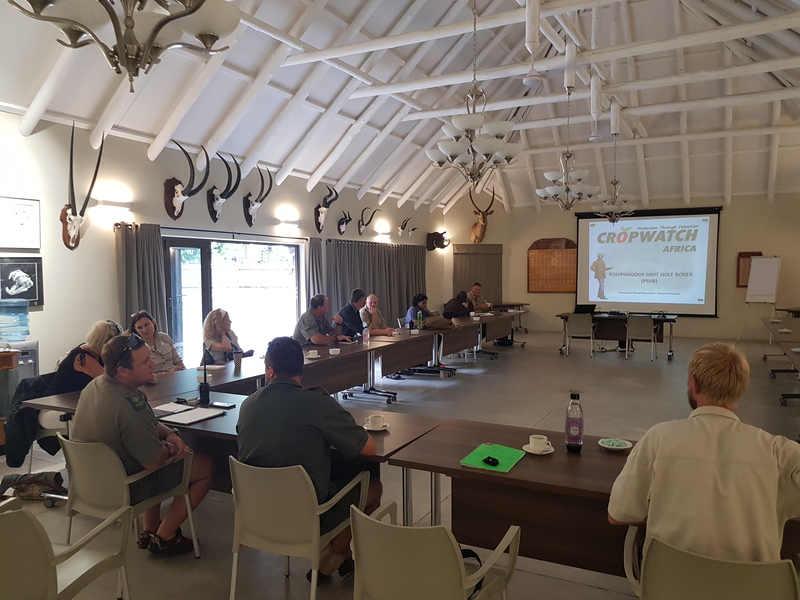 Whilst we are working hard to maintain and grow the connected Greater Kruger National Park, there are those who do not seem to understand the importance of a large, unfragmented open system. The Great Limpopo Transfrontier Conservation Area (GLTFCA), of which the Greater Kruger forms an important part, is a visionary network of linked protected areas. It contains approximately 2,000 lions and over 20,000 elephants. Every single one of these animals can call the GLTFCA home because millions of hectares are secured for conservation purposes. If we want to see thriving wildlife populations together with the economic benefits these can bring to local people, we need to unite behind habitats and wise land-use. This means cooperation between private nature reserves, government parks and other types of land-holdings that are compatible with conservation goals. Getting back to the broader African picture, I am not saying that there are no other pressures on wild animal populations in Africa. Poaching, the bush meat trade, trade in animal parts and Human Wildlife Conflict are all factors affecting a seeming onslaught on Africa’s wildlife. 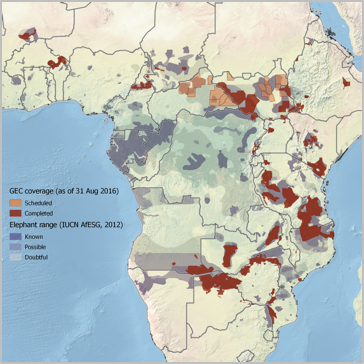 Many of these factors are blamed individually for the plummeting numbers of certain species in Africa, and many people take up a call to battle against one, or a number, of these factors. But, while all of these issues are important, we must not lose sight of the one fundamental truth. Wild animals cannot exist if there is no wilderness habitat for them to live on. 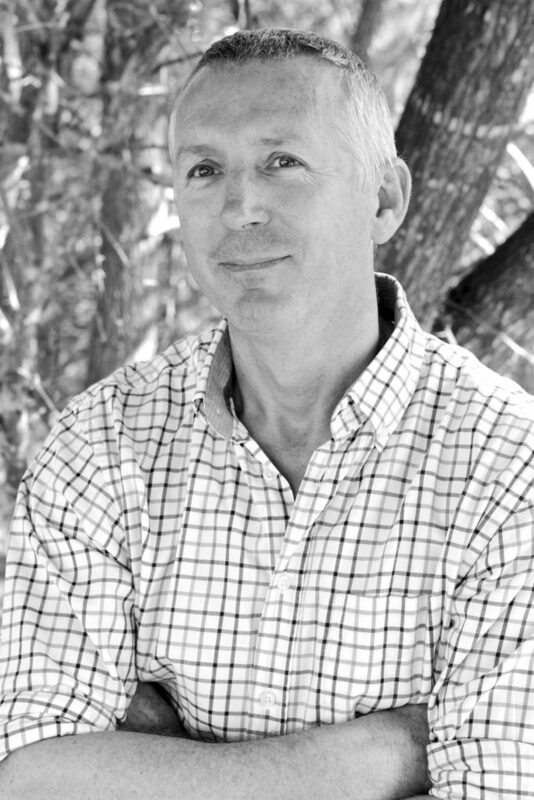 Don Scott has over 15 years of experience in the Aerospace Engineering Industry in Africa, Europe and the USA, as well as 15 years in the safari tourism industry. Don’s journey with tourism started in the Timbavati Private Nature Reserve in 2001. Today, Don and his wife, Nina, are the owners of the Tanda Tula safari camps in the Timbavati. Don is deeply involved and dedicated to both community development and conservation through tourism in the region. He sits on the executive committee of the Timbavati as well as on the Greater Kruger National Park task team for Responsible Tourism and Best Practice.